RUSH: Now, Maude Behar back in 2016 on The View showed a picture of herself dressed up for Halloween one year when she was 29 years old as a, quote, "beautiful African woman," and they flashed a picture up there. She made a point of saying, "That's not a wig that I'm wearing. It's my hair." I don't have the photo here to show you. I'm just telling you, it doesn't look like Maude Behar. It doesn't even come close. But they were talking about it. This is three years ago. But listen to them talking about it . SYMONE: (squealing) Joy, is that you? SYMONE: Joy, are you black! MAUDE: Wait. No, I know. SYMONE: (squealing) She looks black! FARIS: Oh, my word. What...? What year is this? Circa what? MAUDE: I was 29. It was a Halloween party. I went as a beautiful African woman. SYMONE: Oh yeah? You ain’t black. FARIS: Did you have tanning lotion on? MAUDE: I had makeup that was a little bit darker than my skin. KIMMEL: (stereotypical dialect) Sometime in night, Karl Malone look up in sky and say, "What the hell goin' on up there?" KIMMEL: "Do UFO live on other planets phonin' home like E.T.?" 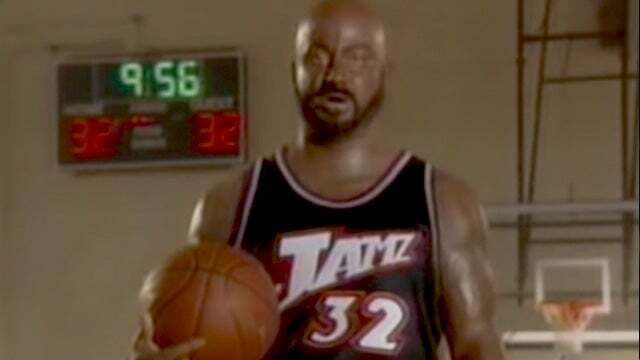 Karl Malone read on TV about white people getting deducted (sic) by aliens. Now, Karl Malone never seen no flying saucer his-self, but if he do, that gonna be a spooky time. RUSH: You wonder why Jimmy Kimmel and some of these other late-night clowns are not even talking about Governor Northam and the blackface photo in the yearbook? Not even talking, 'cause these people all have done it themselves. There's something about leftists. Look at Rachel Dolezal running around as white as anything you can imagine, saying that she's black. And these people all dressing up as blackface doing minstrel shows and Maude Behar doing it and Governor Northam and these people. All at the same time ranting and raving about what a bunch of racist pigs we conservatives are. And they don't even want to talk about their own past.